I know…you’re excited about beets, too. Just another trip home for a family get together; family, friends, Cleveland clouds, nothing to do, lots of driving around to visit people – but there’s something missing. That’s right. The beets. Adam’s mom needed beets for the holiday meal and there were none in the store and it was about to become a catastrophe. I know what you’re thinking. GASP! No beets?! So were we. The mood got tense. People were dropping f-bombs. Someone stormed out of the room. It was ugly. Except it wasn’t. No one was really that upset and then Adam’s mom found the beets at another store. 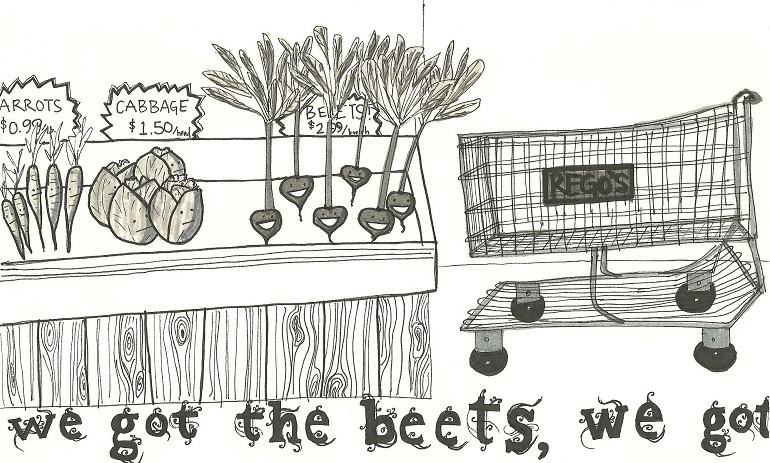 So in honor of a lucky find in the heat of beet season, these cartoon beets are really excited to be found. Go ahead if you haven’t already and cue the Go-Go’s. This is kind of like being Rick Rolled only you provide your own music! P.S. Today I learned that the Go-Go’s sang the song I was thinking of and not the Bangles. Go figure. Who likes pirates!?!?!? Well not the real Somali kind; they are scary.